BP-12120 : 12 volt 12Amp Portable DC Power Pack. EXCLUSIVE from BATTERIES AMERICA. Provides 12 volt power anywhere. Includes 12-volt 12Ah sealed lead battery, Carrying Strap, Padded Case, Heavy-Duty Belt, DC Power & Charge Socket, & Smart Re-Charger. Size: approx. 9" x 6" x 6". Weight approx. 9 lbs. Arrives to you PRE-CHARGED & READY TO USE ! Ideal for any 12VDC portable power requirement. DC socket accepts any DC power cord that would normally plug into a vehicle socket. Use for Communication, Navigation, Travel Charging, Camping, anytime, anywhere ! 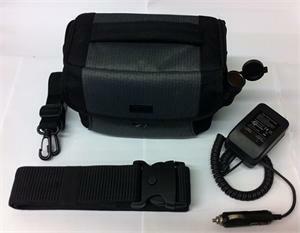 Padded case is extra-reinforced, and can be carried by hand, or over the shoulder. To re-charge the BP-12120, simply plug the Smart Charger into the DC socket, and plug into a wall outlet. Full charge is about 10 hours, with automatic smart shut-off to float charge. The BP-12120 Portable Power Package is exclusively assembled in USA by BATTERIES AMERICA.